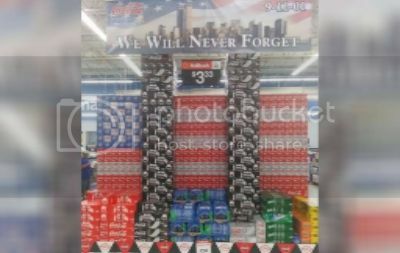 Walmart was heavily criticized after the retail giant stacked up packages of soda cans to look like the World Trade Center at a Florida store. The retail giant meant it to be a tribute to 9/11 victims ahead of the 15th anniversary of the terrorist attack, however, it backfired and was mocked and criticized by everyone. Actually I think the Walmart display is rather clever and doesn't demean 911 at all. Furthermore I believe the criticism arises from the fact this was done at Walmart.